Why is it so hard for software development groups to adopt a different approach or methodology? Why is it so hard for managers and leaders to transition out of the command and control mode? This is a game that you can play at the beginning of a training session to allow people to open their minds that what they are about to learn isn’t easy. It is hard to change and they need to consciously go into the training that it isn’t just a matter of ‘change your way and you will succeed’. The exercise doesn’t have to be about a car, you can choose anything, but this is just an example. With your A4 piece of paper draw a car for yourself. It should fill up at least half of the page. 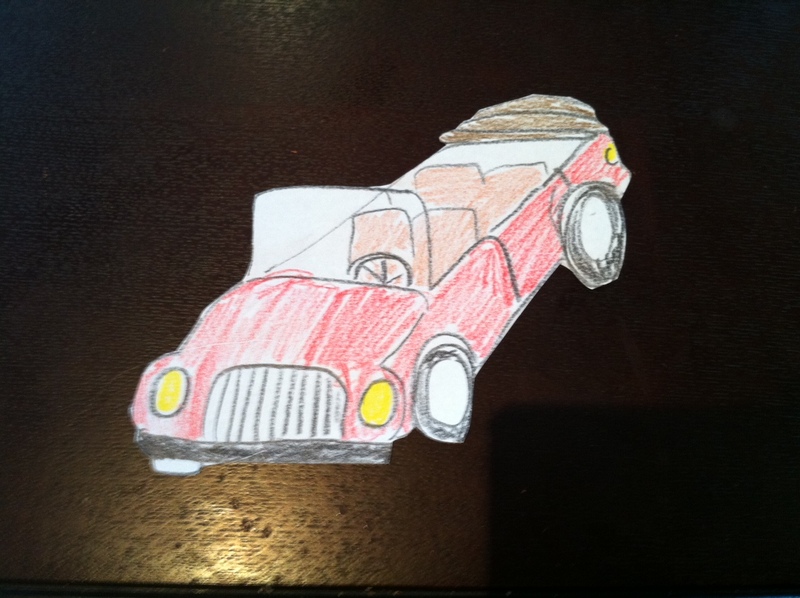 But… the headlights need to be coloured in yellow and the car needs to be coloured red. Once you have drawn and coloured in your car then use the scissors to cut it out. Inform them that you will be timing how long it takes to do the car, but that it isn’t a race. When they are done put their hand up to signal end of time for them. Let them start and start the timer. As each person signals write their time up on the board. Talk about the quality of the solutions, how closely the cuts are against the lines and the evenness of colouring in. Then ask the group to vote using their cards how comfortable they felt doing the exercise (for example 1 is extremely uncomfortable, 10 is extremely comfortable). Write up the comfort scores. Now explain that the activity is going to be repeated again – but this time do not use the same hand that you used the first time. For example, if they are right-handed and used their right hand to draw and cut the first time this next time use their left hand. This second car should be a duplicate of the one they created in the first instance. Explain that they will be timed again and start the exercise. Write up the times again. Before walking through the results ask the group to use their voting cards and to rate how comfortable they felt doing the exercise this time. Write up the scores. The sizing is vastly different. Scale and proportion are beyond what is probably tolerable. The cut out is more jagged and nowhere near as close to the line. The colouring in is less intense and has considerably more whitespace in it. Then have a look at the time differences. The second car will likely be 50-100% longer to do despite having a template and no longer requiring innovation. Then have a look at the comfort levels. They would have dropped but it is likely that there was still a lot of laughter in the room (until the scissors had to be used). Get the group to consider what it would be like if you used the hand that you used for the second car every single day for the next three months and then attempted the exercise again. Ask them to re-vote what they think their comfort rating would be after the three months. Write this up. but if we stick at it for a while then we will get better at it and consequently feel more comfortable. but bit by bit we will get faster and better until our results are comparable. Very interesting excercise. However, many bloggers including this post seem to say, that, people don’t change because it’s hard or they don’t want to. Possibly that is true in some cases, but what about if they are open to change, but they don’t believe that the proposed change is something that is worthwhile. For instance using your off hand to draw, is probably not a change worth having. I would imagine that most people are willing to make a change if they view the upsides as greater than the downsides, but few would be willing to make the change if they don’t see the upsides as greater than the downsides. Last bullet point has an example of a benefit of such a change. No one will change if they don’t see a ‘What’s in it for me’ (which is the last paragraph). Regardless of whether people are sold on change or not they need to appreciate that change is not a silver bullet, that there will be frustrations and issues in adopting the change. Neuroscience says it is not enough to want to change, you also have to believe that you can succeed in it, that you won’t fail. This game iterates that success is not likely to be an immediate effect and that it takes practice re-enforcement over time to achieve desired results. If you don’t go into the change with that mindset then you will quickly become intolerant to the change. Very nice example indeed! Where did you learn this one from? I have always been fond of practical exercises to teach concepts and this will be one I will use in the future, i’m just not sure of when and where. After all, it would be quite interesting to be doing this in the middle of an open plan office floor and have a team drawing and cutting out cars. On the other hand, drawing more attention to the exercise would actually increase the learning potential.